Question (for S./V.) is an exercise in translation: from poem to graphic word-image; from graphic word-image to film. 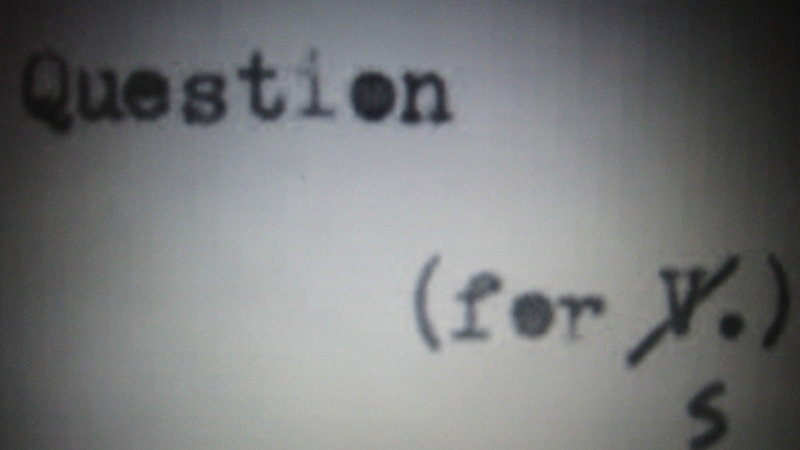 A poem, ‘Question (for S.)', is divided into its constituent lines in order to construct a graphic poem using typewriter and letraset. This is printed onto 6in x 6in sheets of card used as ‘props’ for a film. The film, Question (for S./V. ), consists of filmic shots of the cards using a digital camera. Editing the shots together becomes a means of 'reconnecting' the lines without dependence on scriptural protocols. Instead, image, gesture (i.e. camera movement) and light become the determining factors for how the lines are ultimately 'placed' sequentially in the film-poem.